On October 3, 1995, O.J. Simpson was found not guilty of the murder of his ex-wife, Nicole Brown Simpson, and her friend, restaurant waiter Ron Goldman. On February 4, 1977, in a wrongful death civil lawsuit filed by the Brown and Goldman families, a jury found Simpson "responsible" for their their deaths and awarded the families compensatory and punitive damages totaling $33.5 million. In September 2007, a group of men led by Simpson entered a room at the Palace Station hotel-casino in Las Vegas and took sports memorabilia at gunpoint. Simpson admitted to taking the items, which he said had been stolen from him, but denied breaking into the hotel room; he also denied that he or anyone else carried a gun. Simpson and three other men were charged with the break-in. On October 3, 2008- 13 years to the day he had been acquitted in the Brown-Simpson/Goldman murders- Simpson was found guilty of 12 charges: conspiracy to commit a crime, conspiracy to commit kidnapping, conspiracy to commit robbery, burglary with a deadly weapon, two counts of first-degree kidnapping with a deadly weapon, two counts of robbery with a deadly weapon, two counts of assault with a deadly weapon, and two counts of coercion with a deadly weapon. 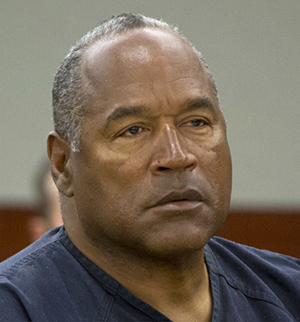 On December 5, 2008, Simpson was sentenced to a total of 33 years in prison. He is eligible for parole in October, 2017, when he will be 70 years old. Ick. A 68-year-old Florida man discovers his 24-year-old bride is his own biological granddaughter. They have no plans to separate. Some people born on October 3 who said some interesting things: John Perry Barlow, Gore Vidal, James Herriot, Thomas Wolfe, Louis Aragon, Eleonora Duse, and George Bancroft. Combine Google with autocorrect, and you get a hit game: Google Feud! Double-dipping your chip into the dip is Not Good. Neither is shaking hands with a stranger. Google is working on a Star-Trek like computer capable of answering any questions posed to it. An interesting story on the decline and exit of Blackberry from the mobile phone market. “The American public needs to wake up and send a message that the tax code should be written to generate revenue and enforced to collect it, not to favor wealthy real estate developers and other special interests and their lobbyists." From The New York Times. She was a 52-year-old woman who had worked 20 years for the railroad, had once been a Democrat and was now a Republican, and counted herself among the growing swath of people who occupied the fringes of American politics but were increasingly becoming part of the mainstream. Like millions of others, she believed that President Obama was a Muslim. And like so many she had gotten to know online through social media, she also believed that he was likely gay, that Michelle Obama could be a man, and that the Obama children were possibly kidnapped from a family now searching for them. The scariest thing you'll read this week.